Anthracnose of grape was first detected in the United States in the mid-1800s. The disease was probably introduced into this country by grape plant material imported from Europe. It quickly established in American vineyards and became a significant disease of grape in rainy, humid, and warm regions of the United States. The disease is not common in Ohio; however, it caused severe damage in a central Ohio vineyard on the cultivar ‘Vidal’ in 1993 and in a southern Ohio vineyard on the cultivars ‘Vidal’ and ‘Reliance’ in 1998. Anthracnose reduces the quality and quantity of fruit and weakens the vine. Once the disease is established in a vineyard, it can be very destructive. Figure 1. Anthracnose symptoms on grape cane. All succulent parts of the plant, including fruit stems, leaves, petioles, tendrils, young shoots, and berries, can be attacked, but lesions on shoots and berries are most common and distinctive. Symptoms on young, succulent shoots first appear as numerous small, circular, and reddish spots. Spots then enlarge, become sunken, and produce lesions with gray centers and round or angular edges (Figure 1). Dark reddish-brown to violet-black margins eventually surround the lesions. Lesions may coalesce, causing a blighting or killing of the shoot. A slightly raised area may form around the edge of the lesion. Infected areas may crack, causing shoots to become brittle. 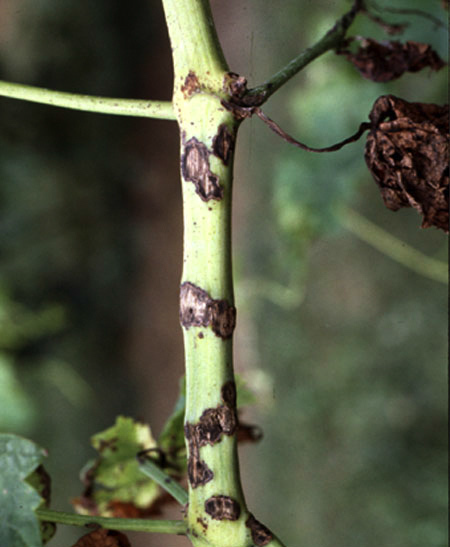 Anthracnose lesions on shoots may be confused with hail injury; however, unlike hail damage, the edges of the wounds caused by the anthracnose fungus are raised and black. In addition, hail damage generally appears on only one side of the shoot, whereas anthracnose is more generally distributed. Anthracnose on petioles appears similar to that on the shoots. Leaf spots are often numerous and develop in a similar manner to those on shoots. Eventually, they become circular with gray centers and brown to black margins with round or angular edges. The necrotic center of the lesion often drops out, creating a shot-hole appearance (Figure 2). Young leaves are more susceptible to infection than older leaves. When veins are affected, especially on young leaves, the lesions prevent normal development, resulting in malformation or complete drying or burning of the leaf. 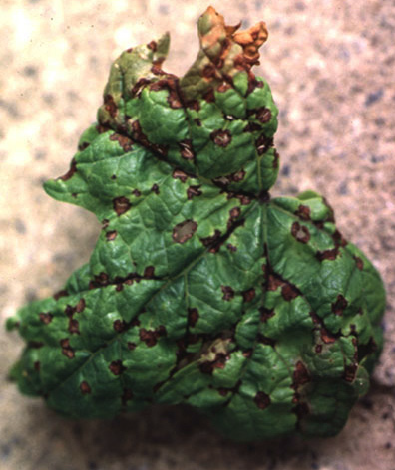 Lesions may cover the entire leaf blade or appear mainly along the veins. Figure 2. Anthracnose symptoms on grape leaf. Note the shot holes where infected tissues drop out. On berries, small, reddish circular spots initially develop. The spots then enlarge to an average diameter of ¼ inch and may become slightly sunken. The centers of the spots turn whitish gray and are surrounded by narrow reddish-brown to black margins (Figure 3). This typical symptom on fruit often resembles a bird’s eye, and the disease has been called bird’s eye rot. Acervuli (fungal fruiting structures) eventually develop in the lesions. A pinkish mass of fungal spores (conidia) exudes from these structures during prolonged wet weather. Lesions may extend into the pulp and cause the fruit to crack. Lesions on the rachis and pedicels appear similar to those on shoots. Clusters are susceptible to infection before flowering and until Véraison. Anthracnose of grape is caused by the fungus Elsinoe ampelina. The fungus overwinters in the vineyards as sclerotia (fungal survival structures) on infected shoots. In the spring, sclerotia on infected shoots germinate to produce abundant spores (conidia) when they are wet for 24 hours or more and the temperature is above 36 degrees F. Conidia are spread by splashing rain to new growing tissues and are not carried by wind alone. Another type of spore, called an ascospore, is produced within sexual fruiting bodies and may also form on infected canes and berries left on the ground or in the trellis from the previous year. The importance of ascospores in disease development is not clearly understood. Figure 3. 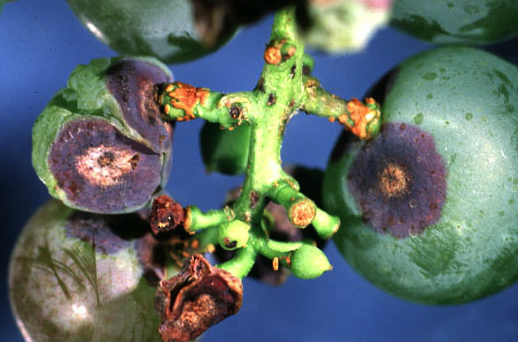 Typical symptoms of anthracnose on grape berry. Note the lesion resembles a bird’s eye. Conidia are by far the most important source of primary inoculum in the spring. In early spring, when free moisture from rain or dew is present, conidia germinate and infect succulent tissue. Conidia germinate and infect at temperatures ranging from 36 to 90 degrees F. The higher the temperature, the faster disease develops. Disease symptoms start to develop approximately 13 days after infection occurs at 36 degrees F and at four days after infection occurs at 90 degrees F. Heavy rainfall and warm temperatures are ideal for disease development and spread. Once the disease is established, asexual fruiting bodies called acervuli form on diseased areas. These acervuli produce conidia during periods of wet weather. These conidia are the secondary source of inoculum and are responsible for continued spread of the fungus and the disease throughout the growing season. Sanitation is very important. Prune out and destroy (remove from the vineyard) diseased plant parts during the dormant season. This includes infected shoots, cluster stems, and berries. This should reduce the amount of primary inoculum for the disease in the vineyard. Eliminate wild grapes near the vineyard. The disease can infect wild grapes, and infected wild grapes have been observed near diseased vineyards in Ohio. Wild grapes provide an excellent place for the disease to develop and serve as a reservoir for the disease. It is probably impossible to eradicate wild grapes from the woods, but serious efforts should be made to at least remove them from the fence rows and as far away from the vineyard as possible. Remember, the spores are spread over relatively short distances by splashing rain and should not be able to move over long distances by wind into the vineyard. Canopy management can aid in disease control. Any practice that opens the canopy to improve air circulation and reduce drying time of susceptible tissue is beneficial for disease control. These practices include selection of the proper training system, shoot positioning, and leaf removal. Fungicide use. Where the disease is established, especially in a commercial vineyard, the use of fungicides is recommended. Fungicide recommendations for anthracnose control consist of a dormant application of Liquid Lime Sulfur in early spring, followed by applications of foliar fungicides during the growing season.